Every morning, I have coffee or tea in this mug. I love it, not just because it’s silly and great and features the screaming gulls from Finding Nemo, although that’s a big part of it. 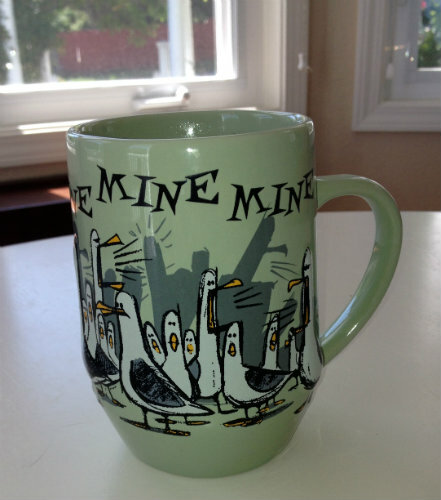 It’s not just because it says MINE MINE MINE, even though that means my family members actually do keep their hands off it. The reason I love it is because it makes me feel like I’m having coffee with Tami every morning. The worst thing about moving so far away was having to leave my friends behind. To all of you back in Oregon and to all of you all over the world, you know who you are, I say let’s do coffee every day. Change never really stops, does it. Categories: Personal | Tags: California, change, moving, Oregon, personal | Permalink. Ok, now I’m crying… I miss you, too. I’m so glad we finally did Disney and glad you’re enjoying the mug. P.S. I think of you and our Disney adventure when I drink from my souvenir Belle mug. It sure is! These days, when so many of my friends are people I only know across the airwaves, that personal touch takes on a whole new meaning. Every person in my circle of friends is equally precious to me, whether or not we’ve met in the flesh.